We went to enchanting Bhutan in February 2017. Our itinerary took us to three cities – Paro, Thimphu and Punakha. In each of these cities, we stayed in good premium hotels that made our trip even more enjoyable. However, our favourite resort was the RKPO Green Resort in Punakha. The resort is green, literally. 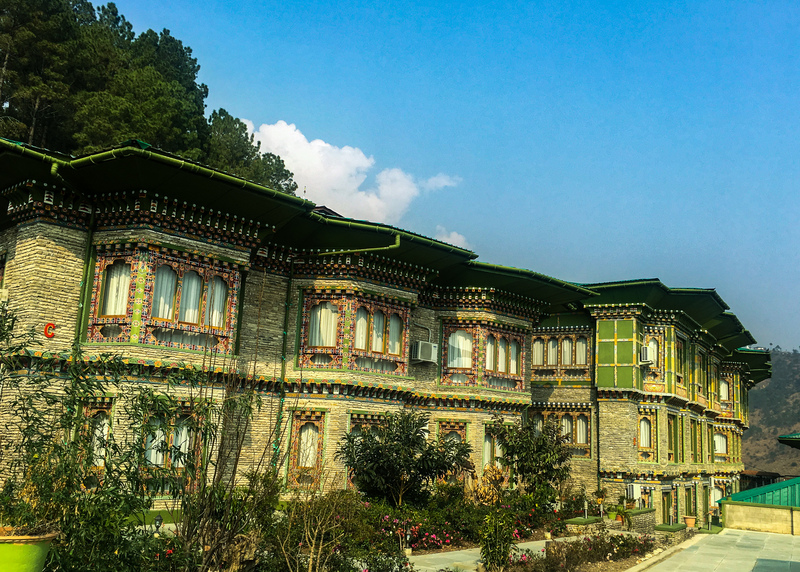 The exteriors are painted green and are adorned with typical Bhutanese paintings, giving it the name. 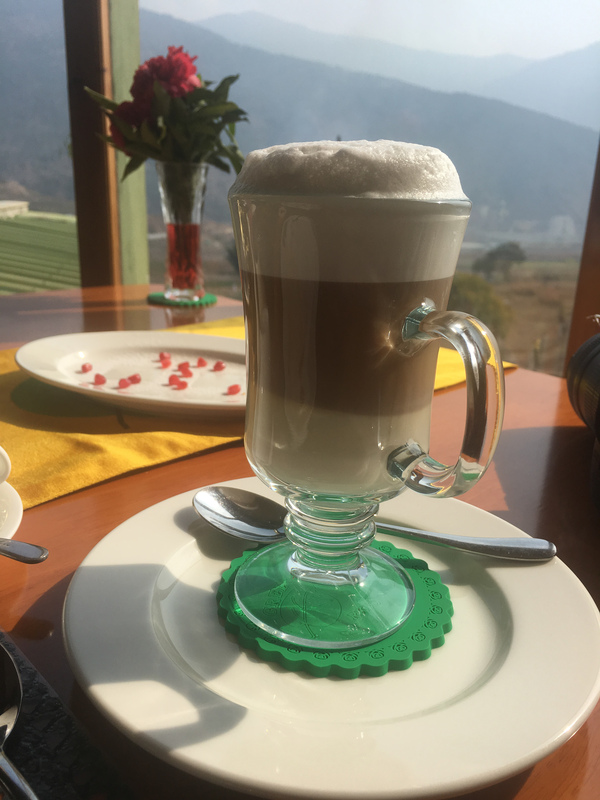 Here is our review of the RKPO Green Resort, Punakha. The resort is located on the highway has great roads leading to it – no need to get into snakey, small roads. The best part about the location is that every room in the resort overlooks the Punakha valley. 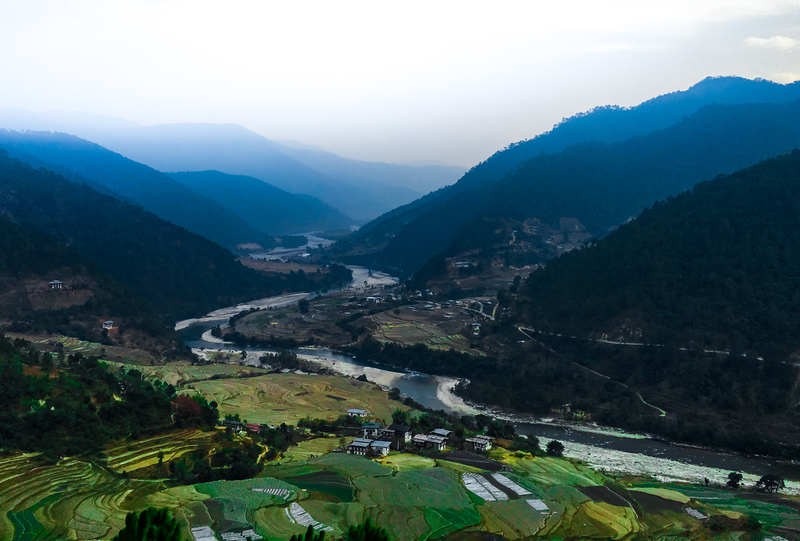 The valley is beautiful and is one of the most fertile valleys in Bhutan. The slopes are cut into steps. Paddy and mustard are grown on the steps. If you are here in February and March, you may be be able to see the bright yellow mustard flowers in full bloom. If you are here in September, you will see the paddy crops swaying in the wind. Check in was smooth. We were welcomed with a wet towel and a drink, which was so refreshing after a long drive. The hotel staff took us to our room and made us comfortable. She also offered extra blankets and heaters in case need be. We felt at home within the first five minutes. Honestly, we didn’t want to leave our room at all for the next couple of days! The check out process was as smooth as the check in process. All bill had reached the billing desk and it took them just a couple of minutes to settle our bills and let us get on with our journey. Our room was large and met all standards of a luxury hotel. There were two easy chairs that allowed us to stretch our legs and look at the fields in the valley. Ankur and I did have quite some wine while sitting there…looking at the valley…and looking at each other! The heating was perfect and we slept very well, even though the nights were cold. The mini bar was well stocked with fancy teas. I loved having a cuppa every now and then, considering there wether was a little chilly. The bathroom was lovely…huge with a very classy bath tub. I was glad that I was carrying some epsom salts to pamper my skin. The gown and towels were spotless and changed everyday. We had all our breakfast and dinners at the hotel’s restaurant. The breakfast was good food and good ambience; we sat in front of the window, soaking in the sun. 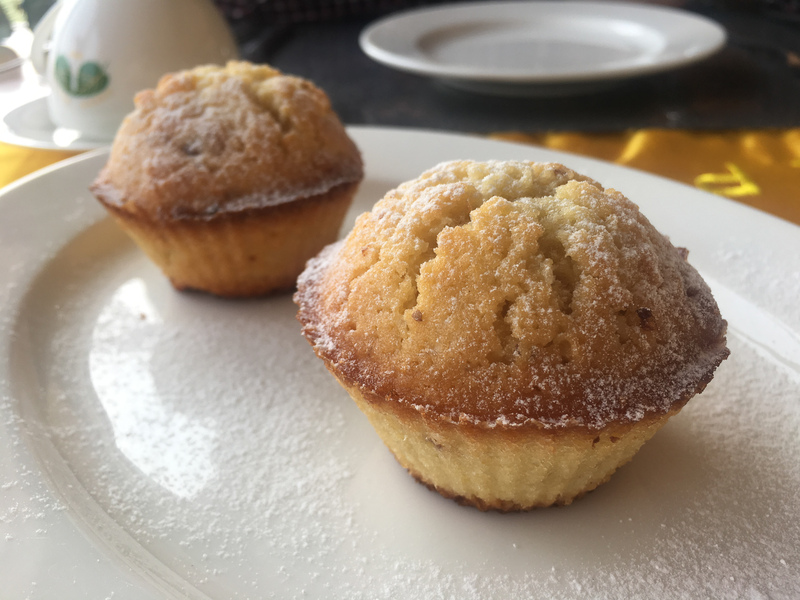 The banana cake and cupcakes were delicious. We also had the aloo paratha, which was delightful as well. One morning, we were getting late for our tour and the hotel packed our breakfast for us. Oh…and I must mention that they have some really good coffee. I would highly recommend trying their latte. Dinner at the restaurant was great experience as well. To start with, they have some excellent local fruity/dessert wine, which we would highly recommend. We tried the local Bhutanese food as well as some Indian dishes and both were excellent. The chilly and cheese in the Bhutanese cuisine and the daal in the Indian cuisine were our favourite. The portion size is good as we ate to our heart’s content. Bhutanese potato and cheese gravy…..yumyy! We checked into our room and within an hour realised that there was a leak in the bathroom. So, we called the reception and told them and within minutes the staff was there to help us move to another room. We had already unpacked. However, that did not seem to bother the staff. They carried all our stuff and arranged it in the other room. Service at the restaurant was great too. They have a bunch of young and enthusiastic kids, who enjoy talking in their newly learnt English. And oh, service with a smile always! 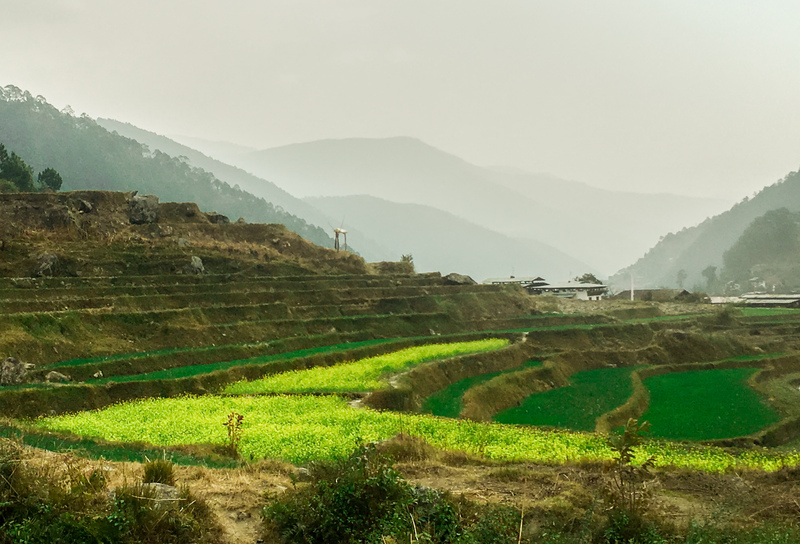 If we do visit Punakha again, and we sure will to see the lush green paddy fields, RKPO Green Resort will be our home again! Note: Our entire trip was arranged and organised by Heavenly Bhutan, and we highly recommend reaching out to Raju and his team if you plan on visiting Bhutan. Our guide, Sajan was very knowledgeable and professional, as was Menuka, who helped us with our itineray and bookings.